Combine flour and butter in a food processor and process until mixture is the texture of small crumbs. Add the salt and baking soda and process until just combined. Add sugars, vanilla, and boiled eggs. Pulse again until mixture comes together. Add chocolate chips and combine by hand using a wooden spoon or clean hands. Egg whites may still be visible in the dough but will disappear as the cookies bake. Make golf ball sized balls of cookie dough and place them on parchment lined baking sheets. Flatten balls of dough slightly with your hand. Bake for 13-15 minutes or until the edges of the cookies are lightly browned. Remove cookies from oven and let them sit on the cookie sheet for 3-5 minutes before transferring them to a cooling rack. Are you up to your bunny ears in hard boiled eggs? You’re probably wondering what you’re going to do with all of those eggs that you dyed for Easter that are hogging up space in your refrigerator. Although deviled eggs are one of my favorite things to eat, there are only so many I can consume in a given time. 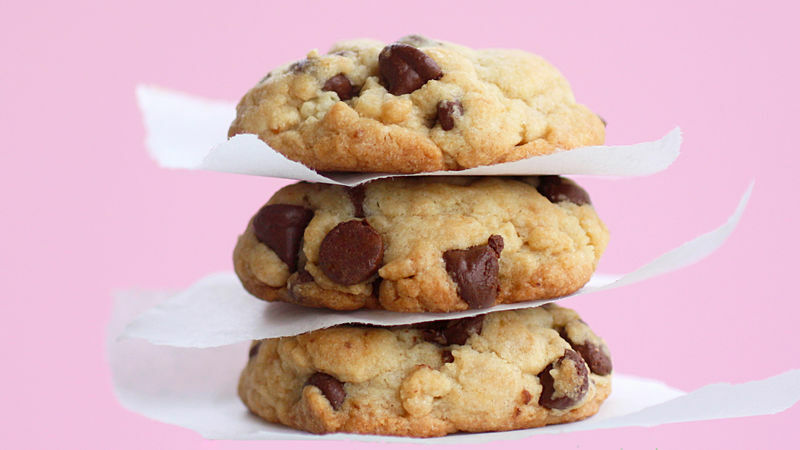 These Hard Boiled Egg Chocolate Chip Cookies are the answer to your dilemma. Before you turn away your head in disgust (which was my first reaction), let’s talk about why this is such a good idea. First of all, chocolate chip cookie dough has raw eggs in it which get cooked when you bake them. So what’s the big deal with just cooking the eggs, or hard boiling them in this case, before we actually bake the cookies? It’s not like it’s never been done before. It’s not an uncommon cooking method in Europe to include hard boiled eggs in baked goods such as cookies. Below you can actually see little pieces of chopped egg whites in the dough. Don’t worry -- once they are baked, those little white pieces will disappear and you will be left with an awesome cookie. But why rock the boat? Is it really worth it to try the hard boiled egg method? YES! The result is a moist and distinctly textured cookie. The texture had me contemplating if this cookie should dethrone my all-time favorite chocolate chip cookie recipe. Yum! Want the how-to for a perfectly boil an egg? Here's the easy answer! Boiling Eggs 101. Then go ahead -- make these cookies!